A review in 10 words (or thereabouts): When some strange man sits down next to Santiago, he sells all of his earthly positions for the journey of a lifetime. This story, dazzling in its powerful simplicity and inspiring wisdom, is about an Andalusian shepherd boy named Santiago who travels from his homeland in Spain to the Egyptian desert in search of a treasure buried in the Pyramids. 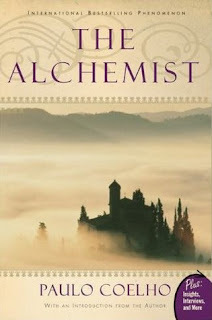 Along the way he meets a Gypsy woman, a man who calls himself king, and an alchemist, all of whom points Santiago in the direction of his quest. No one knows what the treasure is, or if Santiago will be able to surmount the obstacles along the way. But what starts out as a journey to find worldly goods turns into a discovery of the treasure found within. Lush, evocative, and deeply humane, the story of Santiago is an eternal testament to the transformation power of our dreams and the importance of listening to our hearts. Santiago is just a boy. Not a special boy. Not a miraculous boy. Just a boy with sheep, wandering the countryside living his life the way he has always wanted. But Santiago has been dreaming. He’s been dreaming of the pyramids. He’s been dreaming of treasure. He’s been dreaming of something beyond his sheep and his homeland. When a mysterious king approaches him one day, Santiago will venture further than he ever though possible, into the unknown, in search of his Personal Legend. Santiago is a pretty cool dude. He struck out on is own, sheep in hand, to live a life of freedom. He doesn't get spooked when a weird dude starts talking to him about his Personal Legend, and he takes a chance, a leap, for something big and different. He never really gets rattled when things start to turn sour, but is totally real, going back and forth in his head about what he really wants. The alchemist is a pretty awesome dude too. He's found his legend and is taking the time to help Santiago find his own. Apparently this book was supposed to change my life. At least that's what a plethora of reviews told me. Did it change my life? Um...no. Not at all. Way too much build up. And it has one of my dealbreakers...it's deep. I could feel the author trying to tell me something, but I fear his message was lost on me. No surprise there. But the story moves quickly,and as stories and characters go, I really enjoyed Santiago and was rooting for him from beginning to end. I wanted him to succeed and reap the benefits of his hard work and observations. I enjoyed the read. It was a good time. But it wasn't one of my absolute favorites. Worth it though.